I’ve been doing some thinking about things I wish I had known the first time I presented at an educational conference as well as things I observe as I continue to enjoy and learn from the presentations of others at conferences. If you are presenting at an educational conference or to teachers in general, it’s worth considering the following ten tips. Google Slides and SlideShare make this so easy. URL shorteners make it even easier to send a quick link at the beginning of your presentation and on social media. You can try services such as Bitly, Tiny.cc, Tinyurl, and Google URL Shortener. These services are all free. In some cases, you can customize the link in the URL shortener you use. We are in 2017, and there is no longer any excuse not to share your slide deck, presentation packets, and other materials online. People who attend your presentation will be grateful, and you will make it much easier for them to implement your ideas when they go back to their schools. Many conferences offer shared folders or sites where you can upload your materials, but it’s not enough, and it’s especially not enough if you don’t do it in advance. If I can’t access your materials when I’m in your presentation, I am not likely to go back later and try. I find it frustrating when people do not share their materials, and it contributes more than anything else to a negative experience in a conference session. On the other hand, when presenters share at the beginning, I’m really happy and I engage right away because I know I will have a tangible takeaway I can look at later, and I don’t have to furiously try to capture everything in my bad handwriting that I can’t read later. Practice with your technology and equipment. Make sure everything works. Test the sound. Test your dongle before you leave for the conference and make sure you can project. Run through your slides and make sure everything works. Test links. Make sure you have set up proper viewing permissions in advance. Most conferences will have a few people helping with technology needs, but in all honesty, these folks are often running all over a large convention center, and there are never enough volunteers for this job. You really can’t rely on technology help when you present. It’s best if you can troubleshoot and resolve your own issues if possible. Bring any special equipment you will need. It’s probably safe to rely on the conference runners to provide a projector and microphone (if the room is big enough), but make sure you check that projectors and mics will be provided if you need them. If you need a dongle to connect to a VGA cable, make sure you bring it. Make sure it works. Bring a backup dongle if possible, as these cables are particularly fragile, for some reason, and even new ones can break fairly easily. If you have a newer Mac without the Thunderbolt 2 port that connects a dongle to a VGA cable, make sure you bring a dongle that connects to the new USB C ports because no one will have a backup dongle you can borrow. Trust me on this. Bring speakers if you need them, and make sure they work for the size room you are in. If you aren’t sure of the size, it might be worth it to invest in a nice Bose mini-speaker if you present (or anticipate presenting) often. Most conference rooms still don’t seem to be wired for sound. Make sure you bring materials you need. If you are displaying an iPad or other tablet, make sure you have a dongle for a projector; I have never seen an Apple TV or similar mirroring tool at any educational conference I’ve gone to, not even technology conferences. If you want a clicker to switch through slides, bring one. Most education conferences provide very little beyond a room, a projector, and a mic, so if you need anything else at all, you should plan to bring it. If you are not sure what the conference provides, and you haven’t had communication regarding what to bring, don’t hesitate to ask someone if you are at all unsure about what to bring. Make sure your slide deck is easy to see. If possible, test it for the person in the back of the room and make sure everything on the slide deck is visible. Avoid using dark backgrounds, which are particularly hard to see on projectors that are not bright. There are some really cool templates with dark backgrounds, but they are just hard to see in a presentation setting. Also, think about the readability of the fonts you use. Make sure they contrast well with your background and are bold, print fonts. Avoid fonts that are difficult to read. Don’t pack your slides with a lot of text. It’s better to break information down into more slides than to put too much on a single slide. Avoid putting information on the bottom of the slide, as sometimes room setups make it difficult to see the bottom of third or so the presentation. Use a professional-looking design for your slide deck. Templates are absolutely fine, but make sure you avoid unprofessional looking color schemes and fonts. (Comic Sans, I’m looking at you!) Use backgrounds and images that are eye-catching. 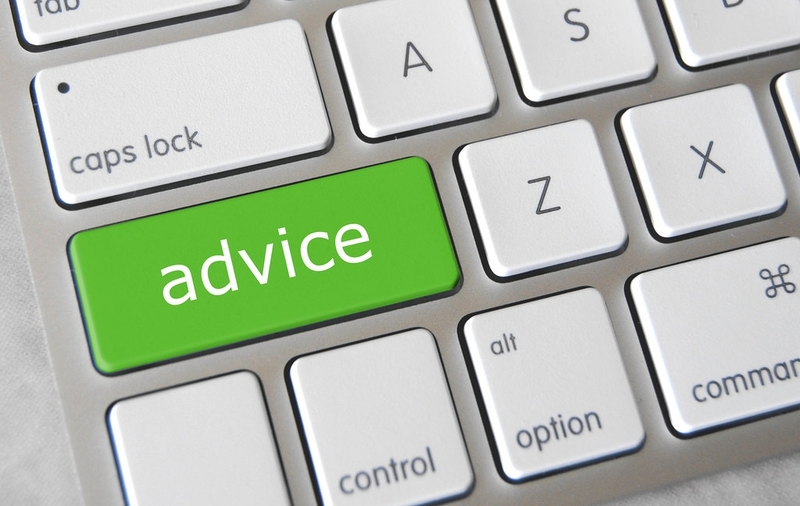 There is a lot of great advice out there for design elements. Research best practices for designing presentations. Avoid relying on conference wifi for any part of your presentation. While it’s a good idea to make your presentation available online, conference wifi is still (in 2017!) sometimes spotty. You can download Google Slide presentations as PowerPoints, and anything you upload to SlideShare probably started as a PowerPoint, a Keynote, or another presentation tool. Download any videos you will be playing. YouTube is notorious for buffering right when you most need it to play smoothly. While you might have the capability of pairing your laptop or other device with your phone in order to have internet access, you should make sure anything you need to access online is available to use. It’s easy to get flustered when your videos won’t play or your slide deck won’t load, so save yourself some stress and make sure you have a backup plan if the wifi isn’t working well. Keep an eye on the time. In many cases, you have a limited amount of time, and if you go over, you may affect other speakers’ ability to share their presentations. Know how much time you have. If you are not sure, ask. Stick to the time you’ve been allotted. When you are practicing your presentation, time yourself. Adjust on the fly when you do interactive activities. Sometimes it’s hard to predict how long activities and parts of your presentation will take. If you consider time well in advance, you will be prepared to make adjustments that don’t compromise the most important things you want to share. Give people time to talk and reflect if you can. Sometimes time is really tight. I have learned that I really enjoy sessions when I can think about the material through writing or discussion with other participants. 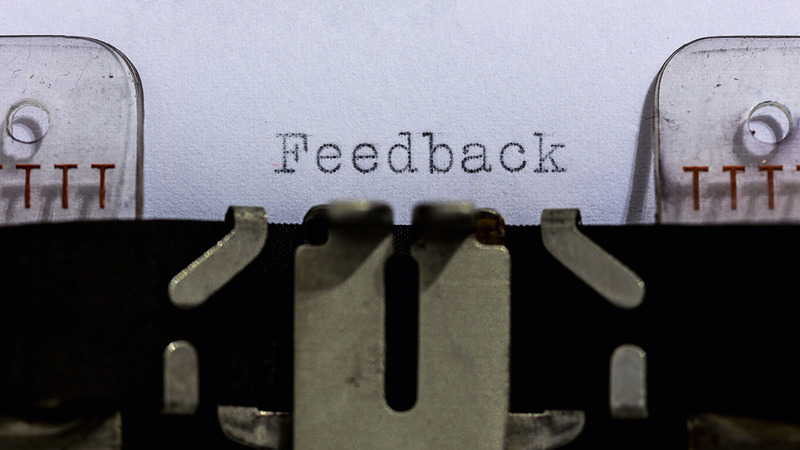 More and more often, conference presentations that do not include elements of interactivity or audience participation or reflection are rejected because participants are asking for opportunities to be involved and to reflect on their learning. People will want to ask you questions or at least share a few ideas, so make sure you give them a platform and time to do so. Sometimes, participants think of wrinkles or problems that we didn’t, and it can be helpful to brainstorm these issues with them and come up with solutions if you can. I very rarely contact people after attending their presentations, but I have done so sometimes, and it’s so helpful if you prominently display ways to get in touch. I usually share my email, my Twitter handle, and my website link. I think I could count on one hand the number of times people have actually contacted me, but I like to leave that door open because as a participant, I would want that information. I often do follow people on Twitter after particularly enjoying their presentations. I came across this article by Jenny Abamu for Edsurge on Twitter the other day (I apologize for forgetting who tweeted it). It articulates something I have been trying to tell teachers for years in my work as a technology integrator and workshop and conference presenter. Too many adults still assume that students can figure out how to use whatever technology they are given, and while they do generally seem less afraid to try something (especially younger students), they frequently don’t know how to use their devices to do some of the most simple things, such as document formatting. The article captures this knowledge gap well, along with a reminder that the digital divide is still an issue we need to contend with as educators. Some time ago, I wrote a post regarding my disagreement with a comment I see shared a lot at ISTE (not sure if it still makes the rounds every year or not, but it used to): What’s Wrong with Asking for PD? One thing I didn’t mention in the post is that often when students don’t know how to do something, such as format a Works Cited page or put information in a header, they simply turn it in without bothering to find out. Of course, a long time digital friend left a comment to that effect on the blog post, and further discussion took place in the comments. I do take time to show students these skills, but sometimes learning takes several exposures before it sticks—I know that’s true for me as well, and probably for most people—and students often don’t want to ask twice. I have found the best method is to require students to fix such errors before it’s assessed, or else they will tend not to bother. They will actually accept the points off rather than ask for help. Obviously, this observation doesn’t apply to all students, but it applies to enough of them. The bottom line is that whether we are working with teachers or students, we shouldn’t make assumptions about what they know and what they don’t. People who don’t know me might be surprised that this gray-haired English teacher knows anything about technology, and the truth is, I didn’t know anything when I started teaching. In my early career, I was definitely in an anti-technology camp. Abamu’s article includes some really helpful videos you can share with students (or teachers) on a blog or learning management system (or just email links directly). I plan to post the videos in my Resources and Study Skills board on my class pages in our school’s learning management system. I was intrigued by Jennifer Gonzalez’s recent post on Cult of Pedagogy, “Is Your Lesson a Grecian Urn?” Basically, Gonzalez argues that teachers need to be careful that their favorite projects are actually assessing learning and are not fluffy ways to fill time. Gonzalez refers to the work of Wiggins and McTighe in Understanding by Design, particularly their description of one of the twin sins of design—activity-based instruction. If you are a long-time reader, you know I think Understanding by Design is the most important book on pedagogy for any teacher to read, and it has certainly been the most influential professional reading I have ever done. I agree with a great deal of what Gonzalez says; she also adds that “all lessons have some educational value [and] any kind of reading and writing, manipulating materials and words, interaction with peers, and exposure to the world in general offer opportunities for learning.” However, she also says that teachers should ask, “Does [this activity] consume far more of a student’s time than is reasonable in relation to its academic impact?” She concludes that “If students spend more time on work that will not move them forward in the skill you think you are teaching, then it may be a Grecian Urn.” She defines Grecian Urns as activities that consume time but don’t necessarily contribute to learning, naming such activities after a Grecian Urn project she describes in the post. Gonzalez explains that “[c]oloring or [c]rafting” should be “used sparingly” after primary school, adding “[t]his doesn’t mean you should never ask students to color, cut, paste, sing, act, or draw, but every time you do, ask yourself if that work is contributing to learning.” While I do see her point, I would argue that some might read her argument as an admonition to cut these art forms from assessments, and I can make a case for using almost all of them for educational purposes. What I fear is that teachers who do not want to incorporate these other ways of learning and demonstrating knowledge will find justification for other teaching methods that don’t work—such as coverage-based instruction (the other of the “twin sins” of design). I ask students to cut when I give them a scene from Shakespeare and ask them to distill its essence, leaving the most important parts intact. In doing so, students are editing and thinking critically about the text. I ask students to act out scenes from literature, a method advocated by the Globe Theatre in London for teaching Shakespeare, because it helps students understand a text to speak it and create movements that communicate the characters’ feelings and actions and the time invested pays dividends in engagement and understanding. I ask students to draw symbols when creating literary reductions because these images help them explain their ideas. Another concern I have is that many people automatically assume technology-based projects are Grecian Urns. Yes, some are. But some are excellent projects, and Gonzalez makes the difference between valuable technology projects and Grecian Urns very clear. I do think some of the commenters on the article read the article as permission to dismiss technology. I would argue that in addition to considerations of time, which are important, we should also consider the value of the assignments, even if they take some time. Could the assignment be done more efficiently without technology? Does technology add any value to the assignment? For example, I find working with digital texts cumbersome. Annotation of printed texts is much more efficient, though tools do exist to annotate online texts. If you have access to a printed text, however, it makes more sense to me to use it. My experience using these online annotation tools is that they just don’t replicate or work as well as what we can do with a pencil and printed text. We should never being using technology for the sake of using technology, but that doesn’t mean we should dismiss it as a Grecian Urn. To be clear, Gonzalez isn’t arguing that we should dismiss technology. But I could see some folks twisting her argument a bit to imply that technology is a time-waster. Time isn’t the only factor we need to consider. We really need to figure out what it is we want students to know and be able to do as a result of a lesson or unit. As Gonzalez advocates, we need to use backwards design and design thinking to plan learning for our students so we can avoid Grecian Urn assignments, but I would suggest that we also think carefully before we decide a project is a Grecian Urn. And if it is, Gonzalez is right—it needs to go. I have stopped doing quite a few assignments over the years after holding them up to Wiggins and McTighe’s description of the “twin sins.” But there is a lot of value in integrating the arts and technology, and we shouldn’t be quick to dismiss that value just because rich arts and technology projects take some time. This year is my first time attending the annual New England Association of Teachers of English (NEATE) Conference. I have been wanting to get more involved with NEATE since moving here, as I was involved with the Georgia Council of Teachers of English (GCTE) before I moved. If you’d like to check out my presentation, my slide deck is below. There are links to resources and other information I used. If you came to the presentation, thank you! My colleague, Lisa Iaccarino, also presented, and once she makes her materials available online, I’ll share them here as well because she rocked it! After we viewed the digital stories my students had created this year, I asked students to evaluate themselves using the rubric I had given them. Next year, I will definitely make time to create the rubric with the students in advance. The rubric I have is good, but the students could make it better. On the back of the rubric, I asked students to give me feedback about the project. I wanted to collect some of their feedback here for those who might be thinking about this project and are feeling on the fence. This feedback represents what the students actually said (warts and all). Don’t change this from being the final exam because it’s an absolutely great way to end the year and it’s really fun. I don’t think anything needs to be tweaked, the timing is perfect, the spacing for due dates is good and the help given is great. I loved the project and how we could all pick whatever we wanted and got to watch everyones. Don’t have to change anything, it was great. In all honesty, I think this project is a lot of fun to put together and all the criteria make sense, even when you don’t think you have a story to tell. It fits for everyone, especially with all you can choose from. I think the idea of this project is awesome. I had a lot of fun with it and finally learned how to use iMovie. I didn’t find anything wrong with the project. I liked this project. It was very fun and I enjoyed watching the videos at the end. I liked being able to pick your own idea instead of being told what to do. I wouldn’t take anything out. I liked where you checked our script too. It really helped me at least with knowing it was ok. The project is great! I enjoyed every part and was excited to do it every step of the way. The one part I had difficulties with was the sound aspect. The sites are great [sites I provided for finding public domain and Creative Commons media] with so many options, but I’m not good at picking things like that. Thank you for helping me find the “perfect” one (better than I could have done). I don’t know how you could improve it. I thought it was well explained and fun. I would keep everything the same. I don’t think there should be many changes to the project at all. It’s a really good and fun project. I enjoyed making my video and going back to find everything. You should keep this project next year. I really enjoy doing the digital story. The project was very clear and I really like how our final was a project. The project helped me become more creative and engaging. Personally, I really like it and nothing should be changed. Also, I learned a lot in this class, and thank you for a great year, Mrs. Huff! This project was very fun. I enjoyed our own choice of theme. It was even fun looking back at old pictures and reliving my little league life. One thing that did frustrate me was learning to use different applications on my computer. If I was taught throughout the year to use these different sources this project would have been much more enjoyable. Overall a great project. I have to point out that last feedback came from a student who struggled with the technology to the point of wanting to give up and take a zero. He persevered, and he did a fabulous job in the end. He was very proud of his work. His feedback about using the software earlier and more often is legitimate. Many students tell me this project is the first time they have opened the iMovie and GarageBand applications on their school-issued computers. I had a lot of fun doing the project, I enjoyed showing where I’m from and I hope my video would inspire someone to visit one day. I like the project and we have enough time to do it. Students seem to love this project, and even those who struggled said it was a great project and should be kept in the curriculum. Students seemed to feel they had enough time to complete it. I was worried about that because I gave them more time last year. Students appreciated the agency they had as they created the project: picking the topic and telling the story they wanted to tell was an important reason why they enjoyed the project. I am very happy with my music choice and the amount of pictures I chose. I had a lot of good pictures. I liked how I had the music start after I said the title. I thought I had the perfect music and well placed pictures. I did not have many pictures, but I was able to think of ways to get around lacking pictures. I paid lots of effort on it and I really enjoy this project. I did well with the pictures as well as the story. This project was very challenging for me from the start. After figuring it out things began to come together. Once my voiceover came in I started to enjoy the project. I think my video has pretty good background music and photos that go along with the voice. All these comments tell me that the students feel good about what they were able to do. They offered fair criticisms as well. Most of them didn’t feel 100% confident their voiceovers were as good as they could be, but that could also be they are not used to hearing their voices and worry about how they sound (most of us feel that way when we hear ourselves on a recording). This project makes for a great culminating narrative. They worked on narrative writing, and putting their personal narratives together with image and music to tell a story using video was a great way to see what they had learned about telling a story. And as it turns out, they learned a lot. I’m really proud of them. Some weeks back, I was looking at my site statistics. It’s not something I do a lot, but every once in a while, I like to see what people are searching for that led them to this site. It’s curiosity more than anything else. I noticed that someone Googled terms that were something like “technology to use with ________.” I’m being a little vague on purpose in the hopes that I don’t inadvertently embarrass anyone, especially because what I really want to do is help. Looking for “technology to use” with anything is putting the cart before the horse, but I think I understand why people do it. Whenever you design a lesson or unit, it’s best to start with this question: What do I want students to know or be able to do at the end of this? Backward design really will resolve a host of planning problems because everything you plan will lead to the answer to that question. Backward design will help you figure out what to do during individual lessons. Backward design will help you figure out which texts to teach or what kinds of writing assignments students should do. Backward design will help you figure out which technology to use. Individual lessons, texts and writing, and technology are not the ends themselves—they are the means to the end. They are the materials you use to reach the learning goal you’ve set. As such, asking what kinds of technology you might use to teach X is putting the focus on the technology instead of on the learning, and it probably won’t take your students where you want them to go. The best analogy I can think of is the apple unit described in Grant Wiggins and Jay McTighe’s Understanding by Design. If you’ve read the book, you’ll remember the description of this unit—lots of fun activities about apples, but not much understanding or deeper learning taking place. When you design a unit for students, you want to think about what activities you might use or create that will help students reach learning goals. If, for instance, one of your goals is that students will understand Shakespeare’s language, you might design a series of lessons that engage students in study of his language—lessons in denotation, connotation, stress, and inflection that lead to an understanding of subtext; lessons in Foley art and sound effects in creating a podcast or radio play that communicates the tone and mood of a scene; lessons in diction that teach close reading. 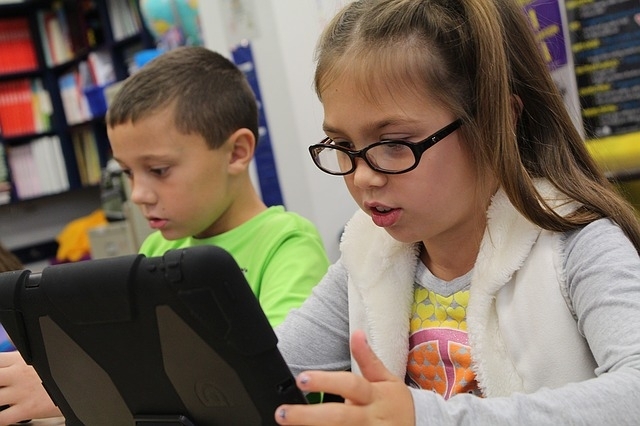 Might you use technology for these lessons? Perhaps you might create an engaging lesson using technology to teach Foley art and sound effects because the technology will add relevance to that lesson. Without technology, in fact, students might not understand the point of the lesson at all. However, it might be wholly unnecessary to use technology for teaching subtext or diction. In fact, plain old books, pencils, and paper might be the best tools to use. When should you use technology? When it will make learning easier for students or when it will make learning possible for students. Technology is meant to save us time. If it’s not saving us time, or if it’s actually impeding the learning, we should think about why we’re using it. On the other hand, technology enables us to do many wonderful things we couldn’t do without it. If we can extend learning in ways that we couldn’t without using technology, then of course we should use it. If using technology is going to help engage students, we should use it. I’m thinking here of my colleague Lisa, whose 8th grade students blog. If they just wrote for their teacher and their classmates, they wouldn’t have the larger, more authentic audience that blogging offers. I’m also thinking of my colleague Pete, whose math students used robots to learn integers. Could Lisa’s students have learned writing without blogging? Sure. But blogging provides an audience and adds engagement. Could Pete’s students have learned integers without robots? Again, sure, but the robots add engagement and help students visualize the number line in a new way. Why search for technology to add to our lessons instead of thinking about the lessons first and whether or not technology will enhance the learning? My hunch is that the person who was looking for technology to use with X was probably told he or she was not using enough technology. Perhaps an evaluation indicated as much. It’s impossible to know for sure. The best way that administrators can support the use of technology is to provide opportunities for faculty to learn about it and give them the tools they need. I don’t think it’s wrong for faculty members to ask for help using technology. Too many schools want teachers to use technology without really giving them proper tools to do so. In both cases, what often happens, is the teachers are labeled “reluctant.” In some attempt to appease, they might just resort to Googling “technology to use with X.” They won’t find the answers they are looking for that way. They might find a one-off activity, but without some real thought about lesson and unit design, it’s not likely that any sort of technology will help teachers reach their goals. I struggled with whether to write this post or not because digital stories are personal, or they can be personal, but I really believe my students have done good work that is worthy of the world, so I am plunging in. As I have mentioned before, I went to a digital storytelling workshop last summer. It was life-changing. I decided I had to do a digital storytelling project with my students, but the concept of narrative needed to be woven through the year in order to make the project work. I asked my students to listen to podcast episodes of This American Life to learn more about storytelling in general. Students chose to examine the stories or the production values or related the stories to a story of their own in a written reflection each month. Students really came to enjoy these assignments. Often after a due date, they came to class talking about the episode they chose to listen to and recommending it to others. I still recall one student writing in his reflection that he thought all his classmates should listen to the episode he chose, even if it was not for an assignment (that’s how I knew the kids were really getting the point). I also wove narrative writing into the curriculum, particularly in the second semester. We wrote narrative essays and discussed elements of storytelling. Next year, I want to do a better job with shorter narratives that will help my students learn to show more instead of tell. When the time came to begin the project, I started with some good digital story models. We brainstormed ideas for topics and had a topics workshop that the students really liked. We shared ideas for stories and gave each other feedback on the ideas as well as thoughts about how to proceed with the stories. This stage of the process was absolutely critical, and the students agreed that it needed to remain a part of the project next year. I myself found this part of the process to be the most valuable when I went through the workshop. Next, we wrote drafts of the digital story scripts. And we workshopped the drafts. And we wrote second drafts. And we workshopped second drafts. I limited students to 300 words, but I think I will raise the ceiling next year to 400-500 words. I am worried that in doing so that the videos will get too long, but I think students will find it easier to cut than add details. One important thing I learned in my own workshop is that five minutes is really a good upper limit. Longer, and the viewer loses interest. Three minutes seems to be a sweet spot. After that, I gave students a tutorial in using iMovie and GarageBand to put together their movies and record voiceovers. One issue I noticed is that students recorded their voiceovers in one single chunk. Next year, I will give them more guidance on pacing and cutting up their voiceovers into segments so there is judicious use of silence when viewers can take in the images and music. One student commented that more of a tutorial would be helpful, but the best way to really learn how to use the software is to use it. I think we can show people how to use technology, but until they actually use it, it’s hard to learn. Another student suggested I could collect a playlist of helpful tutorial videos for iMovie and GarageBand, which was a helpful (and obvious) suggestion that I will will definitely implement next year. Students felt they did have enough time to complete the project. Keeping in mind we did a process of revision and were also doing other things in class, such as reading literature, writing, etc., we spent about a month on the project from start to finish. That is not a month of working on it every day, but we did have class time to work on it, particularly with scripts and with iMovie drafts. I checked with students at various stages of project completion. About a week and half ago, I was really worried about the projects. Right before a performance or a game, practices look terrible, and teachers and coaches often despair of students pulling out a performance at the concert, play, or game. Learning is messy, and it never looks messier than with a project that both the teacher and the students are trying for the first time. In the end, I think the students made some quality videos. I am proud of what they did. You can view their work here, and cycle through the videos using the fast-forward and reverse buttons if you want to skip around. I have written before about the profound experience of attending a digital storytelling workshop run by the Center for Digital Storytelling, but I thought I would gather here some resources for teachers to use as models for students. Selfishly, it helps me by gathering all the models I want to use for my own students in one place. Some of these videos were made by my workshop facilitators. Others were shown to participants at the workshop. Still others are stories I found compelling and plan to share with my own students. The final two are my own stories, and feel free to share them with your students. 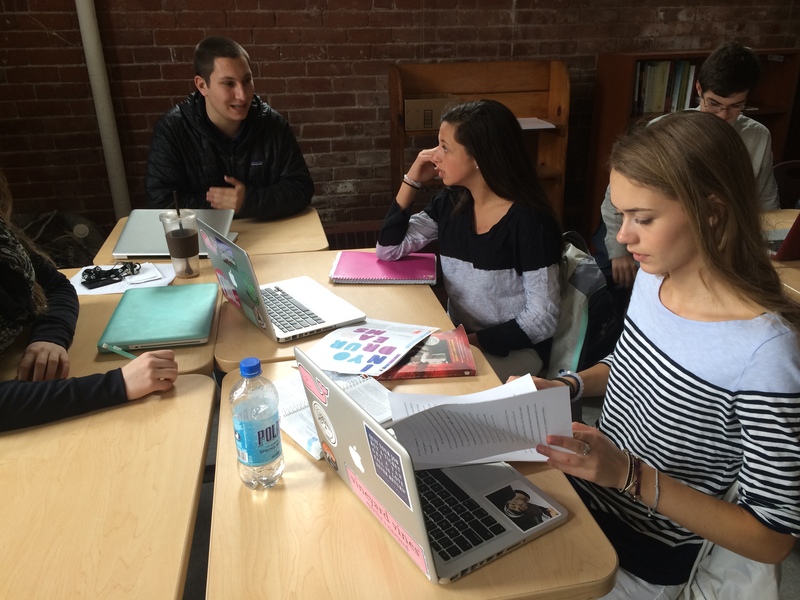 If you ever get a chance to go to a Center for Digital Storytelling Workshop, do it. Featured on the CDS website right now, a short and incredibly moving video about adoption and expectations. Holly was one of the facilitators at my workshop, and we saw this video during the workshop. I love the way Holly was able to use the song her father recorded in the video. Daniel Weinshenker is the Rocky Mountain/Midwest Region Director at CDS and was present when we shared our own digital stories at the end of the last day of the workshop. We watched this video during the workshop. This story is a remarkable example of what students might be able to do with just one photograph, no music, and a powerful narrative. Students think a lot about who they are, and pieces about identity are important to share with students, especially those who think they don’t have a story (we all do). This excellent letter to a beloved grandmother not only tells a powerful story, but also shows what finding the perfect music will add to the video. We saw this one in the workshop. What I liked about this one was the way in which the video’s creator tied the story of her own car to the greater history of women. This wonderful video shows what students might do with a single Foley sound effect. This one is a little on the longer side for a digital story (we were advised to try to keep the videos at shorter than five minutes, but it tells a powerful story about place and family. This story is told with a series of self-portraits strung together in a powerful narrative about difference. This video is a good one to show students about the power of well-timed music and what they can do with video that might not even illustrate the narrative they’re telling. Again, a little on the long side, but worth it and and a great example of pacing. I also liked this one as a poignant story about being the other and well-timed music. This one is mine, and it includes an interview with my grandfather about World War II. 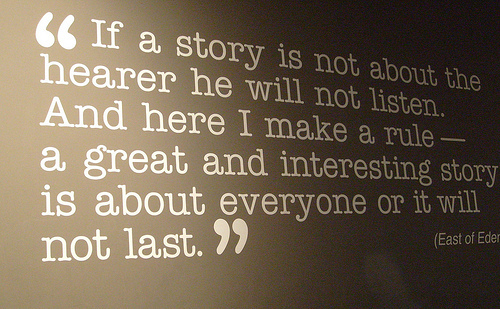 Students might find an interview with someone else will add something to their story. This last one is really my grandmother’s story. It also includes an interview. As soon as I heard the music, I said, “That’s the piece,” and once I added it, I could hear how the music pulled the whole story together. Before I get into the meat of this post, I wanted to mention that I’ve been having some issues with pages taking a long time to load and general slowness on this site. I put in a help ticket with my web host after trying to fix it myself without much success. The site appears to be running more smoothly, so even though I haven’t heard from my host, I am wondering if they took a look already and figured out the problem. At any rate, please be patient with me if you are having issues. This year, I am trying a new experiment using Evernote for my lesson plans. I love Evernote. I use it quite extensively for personal note-taking, such as keeping my soap-making journal, planning trips, and the random article or PDF I want to save. I have Evernote Premium, which allows me to annotate and take notes on PDF’s as well. I also have offline access to notes, higher monthly uploads, and some other additional features, but I mainly wanted to be able to annotate PDF’s without using a separate app. As much as I use Evernote, I wasn’t really using it for lesson planning at all. When I inquired on Twitter, I discovered Jim Burke would not be publishing a 2014-2015 Teacher’s Daybook. I had decided to go back to the Daybook after trying an electronic planbook that was brilliant, but just wasn’t working for me (not sure why). I was bummed about the Daybook, and though Jim publishes the templates online, I just didn’t want to print them out. Something told me that I wouldn’t stick with it. I happened on Nick Provenzano’s post about using Evernote to plan a while back, and I decided to give it a shot, particularly since I already liked Evernote. First, I created Evernote notebooks for each of my classes. This process is fairly straightforward, so I’ll skip the explanation, but if you have trouble with it, feel free to ask for clarification in the comments. Navigate to the appropriate notebook (in my case, World Literature II or American Studies in Literature—whatever you called your class). Add a new note and name it with the correct month and year. Go to my calendar template note and copy the text in the note (the calendar grid). Paste the text into my new note. After I created the calendar template, I created a daily lesson plan template. This template suits my needs. It includes my school’s Portrait of a Learner (objectives), which are not as extensive or complicated as CCSS. This template forces me to think about a good hook or interest grabber at the start and how to tie everything back together at the end of the lesson with a good wrap up. In between, I can list all the parts of the lesson with detail. I can think about which areas of Bloom’s Taxonomy the lesson addresses and be thoughtful about the kind of homework (if any) required. My favorite part, however, is a reflection. After the lesson, at the end of the day usually, I take about five minutes and write short reflections on the lessons. I can link the daily lessons on the calendar template by right-clicking on the note and selecting “Copy Note Link” in Evernote. 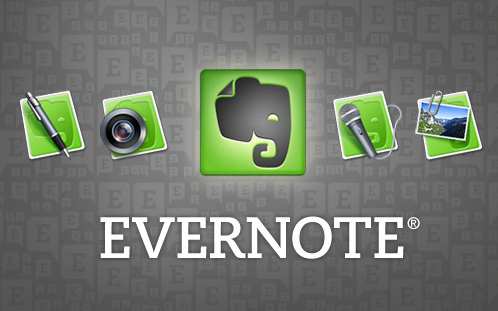 Here is Evernote’s Knowledge Base article on this topic in case you need help. Then I paste that note link on the appropriate date in the calendar, and I have a nice, linked up monthly planner that organizes my daily plans. In addition, I use tags, such as unit titles, course titles, book or other literary work titles, authors, and types of lesson (e. g. writing workshop) to further link my notes. I can then search my notebooks using any of these tags and see all my lessons from a given unit, course, etc. Evernote notebooks can be shared, so using Evernote is a solution for teachers who are planning together as well. So far, I am liking it quite a bit. I’ll keep you posted on the experiment.